Homeschooling preschool is fun. It can be messy because young children love to learn by doing. Schooling at home may be noisy because preschoolers learn best by playing. Let's look at what we can do with these energetic children to help them learn about their world. One way that preschoolers learn is by using as many of their senses as possible. They need to see, feel, and hear to really understand a concept. You can accomplish this with themes or unit studies. You can build themes around almost any interest that you or your child has. First think of a subject. Find picture books about the subject to read to your child. Teach your child the alphabet with themed alphabet books. There are also themed number books to teach your child math concepts. Next find some hands-on activities that you can do together. Think about what science activities you can do. If appropriate do some cooking in the kitchen. Almost all preschool themes have some art or crafts project that you can do. Bible lessons - I developed character themes using stories from the Bible. Ideas - Need more ideas for themes? Here is a list of over 50 ideas. Zoo – Books, crafts, and other activities that center around the zoo. Jungle - Activities that center around the rainforest. Use several animals to teach biblical character. When homeschooling preschool math use a lot of hands-on activities. Have your child learn about same and different by sorting items. After the items are sorted count each pile. Have your child solve simple math problems by setting the table. If Dad is not there for lunch, how many plates do you need? If you have company for dinner how many more plates do you need? Introduce your child to fractions by cutting his sandwich into half or fourths. Another idea is to share an apple by cutting it in half. Also make simple recipes with your child. Preschool Math Activities – has hands-on activities that you can do to teach your child math concepts such as patterns, more/less, and shapes. Numbers – has counting activities, number books, and number recognition activities. 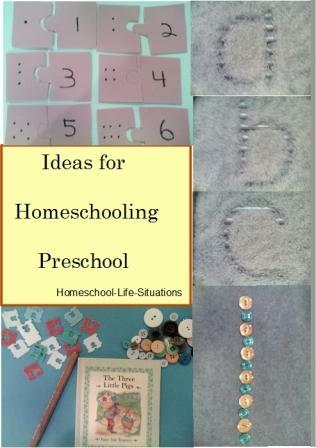 Homeschooling preschool should include lots of pre-reading activities. Pre-reading activities involve learning about real stuff. Do science activities with your child. Observe nature with him. Teach him about God. When you expose your child to different ideas and things it gives them a reason to read. The knowledge also helps them understand what they are reading in books. Reading to your child is also important. Books and stories give your child something to think about. Your child can relive their own experiences. Young children can also experience cultures and events that are different than theirs. Reading aloud also teaches your child how print works. They learn that we read from left to right. Children also learn that letters make sounds and words have meaning. Reading can also increase your child’s vocabulary. Homeschooling with picture books – When my children were young I used picture books to help me teach. So when should you teach your child to read? It will depend on your child’s interest, motivation, and readiness. You will know by observing your child. Is he interested in letters and sounds? Does he already know some words? Sometimes your child will resist learning to read. You can stop teaching. Do some more pre-reading activities. Try again later. Soon he will begin to read. Alphabet activities - When your child is ready to learn his alphabet here are some activities that are inexpensive and fun. There are a lot of different activities that you can do when you are homeschooling preschool. Besides reading books we did a lot of art and craft projects. Cutting, drawing, coloring, and pasting can help develop fine muscles. This is important for when a child learns to write. I also taught my children about colors when we were doing crafts. Colors are an important early childhood skill. Crafts can also teach about patterns. Patterns are a pre-math skill. Art and craft projects are fun for your child to do. He will want to do lots of crafts. Supplies - Here is a list of supplies that you will need to teach young children. We did a lot of science observations when my children were preschoolers. We observed nature. We went on walks together to look at flowers, trees, and birds. We put up a bird feeder and watch the birds that came. We planted a garden and watched the plants grow. We went to the zoo to see wild animals. We also played with water. My children learned what items would float and which sank. We observed rainbows. We learned how to mix different colors. Playing outside is also important for young children. There is some evidence that they need to develop large muscles before they can learn to read. So go outside and play catch or hopscotch. Teach your child to jump rope and to skip. When it was too cold or wet outside we would play inside. We had toys for imaginary play. We did jigsaw puzzles together. Both inside and outside we had fun together. I really enjoyed homeschooling preschool. I took a relaxed approach and did not worry about teaching formal school. We did a lot of hands-on activities, read a lot, and played.